Warning - a Counterfeit HOLY SPIRIT ! A dangerous spirit is entering Christian churches in North America. That spirit is prophetic, offers visions, dreams, and feelings of peace. It even looks like the Holy Ghost and only the most discerning are seeing it. Traveling has provided me an opportunity to experience many things while seeing the ministry of the Holy Spirit in lots of different circumstances. I've seen some things recently that look like the Holy Spirit but are not. There is a counterfeit Holy Spirit entering Christian churches. One of my first experiences was in a particular church service. The minister was preaching, praying, and prophesying. It looked like the Holy Spirit was moving but something was wrong. There was a clash in my spirit and I just couldn't enter into the service. My spirit was not in agreement. I even felt like my spirit was warring against something unseen. It didn't make sense to my head because everything looked right. As the service progressed I stayed in prayer then suddenly I saw it, the Holy Spirit opened my eyes and I saw another spirit on this preacher. It was one of the highest occult spirits I have ever seen. It was a serpent looking reptile curled around this man's spine and laying across his shoulders. It was really difficult to see because it camouflaged itself becoming transparent at times. Later I asked the intercessors with me if they had a witness to what we saw and heard. Like me they confirmed that the preaching was good but something was wrong. They just didn't know what it was. I told them what the Lord showed me. This person dear reader is a popular Christian speaker, writer, and television guest in America. I was very grieved in my spirit after this experience. This man was not flowing in the Holy Ghost but another spirit. I believe the name of this counterfeit Holy Ghost is Kundalini. Kundalini is a New Age serpent spirit. Let's explore this spirit, where it came from and how it entered America. Please ask the Holy Spirit to help you see its deception. Don't just take my word for what's happening, pray and do your own research. Later in this essay I'm going to let you hear audio of this spirits' operation in a Christian church. It might even be in yours. The Kundalini spirit gained access to the Western world from India through New Age teaching. It is popularly known as Yoga. Don't for a minute think that Yoga is harmless. Yoga is an inherent part of Hindu philosophy which teaches man and nature are one with divinity. Satchidananda opening the 3 day Music and Alternatives festival. By the time you finish reading this material you will see it for what it is, a destructive demonic spirit. Although Kundalini Yoga is popular every Christian needs to understand that Yoga is a forbidden practice. 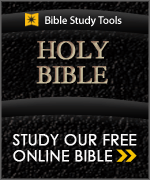 Scripture declares, "Thou shalt have no other gods before me"(Exodus 20:3). Kundalini is an anti-Christ spiritual counterfeit of the Holy Ghost. My prayer is that all Christ' Holy Ghost filled intercessors across America will see what I saw. To bind this serpent spirit, cast it out, and for every bible preacher and teacher to discern this spirit and close the church doors to its occult operations. Back in 1967 the musical "Hair," opened with the song "Aquarius" with the memorable line, "This is the dawning of the Age of Aquarius." This song swept the country and ushered in an awareness of the Aquarian age concept. The song also defined the dawning of a "New Age" with the lyrics, "When the Moon is in the seventh house, and Jupiter aligns with Mars; then peace will guide the planets, and love will steer the stars." 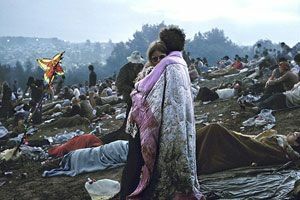 The Woodstock concert in New York in 1969 drew over 500,000 youth across America and was billed as "An Aquarian Exposition: 3 Days of Peace and Music". New Age Yoga teacher Yogiraj Sri Swami Satchidananda opened the festival with prayer. His real name is C. K. Ramaswamy Gounder, an Indian "Yoga teacher and spiritual master." 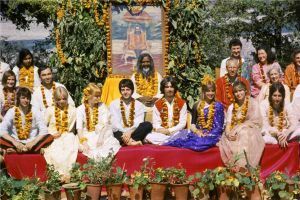 He was also the author of many spiritualists’ books on "Hatha Yoga" and influenced many including the popular artists Peter Max. Veteran actress turned New Age teacher Shirley Maclaine came along in the early 70's teaching reincarnation, trans-channeling, and transcendental meditation. She writes, "When I walked across Spain on the pilgrimage called the "Santiago de Compostela Camino," I encountered myself in a former life. I discovered a part of me that lead to a greater understanding of myself." One of the common themes amongst New Age teachers is the focus on self. Maclaine later wrote "Out On A Limb" a popular book outlining her New Age awakening. Christians know there is no such thing as reincarnation. Scripture says,"It is appointed unto men once to die, but after this the judgment" (Hebrews 9:27). Later came Oprah Winfrey whom America wrongfully thought was a Christian. 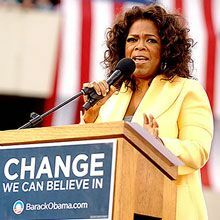 She is in fact a New Age proponent and was host of the highest-rated talk show in television history as seen by 15 million viewers daily in 132 countries. Winfrey started her own New Age church because she believes in a mystical New Age god calling it a force. She said, “…the force, I call it God.” Trusting in the spiritual self (Yoga beliefs) is nothing more than a perverted form of religious humanism cloaked in spiritualism. Oprah often weaves bible verses in her teachings but clearly holds to a misdirected view of God. If God does not direct a person through His Word then the only thing left are humanistic inner voices, twisted antinomian mysticism, or familiar spirits to provide guidance. On one program with New Age authors Betty Eadie, Sophy Burnham, and Dannion Brinkley, Winfrey alluded to the book “Ishmael” by Daniel Quinn, saying, “One of the biggest mistakes humans make is to believe that there is only one way. Actually, there are many diverse paths leading to what you call God.” A Christian in the audience corrected her saying that Jesus was the only way to God. The panel was upset to say the least. Oprah responded, “There couldn't possibly be only one way. Does God care about your heart or whether you called His Son Jesus?” The point is that man can’t save himself, he needs a savior. Only Christ can fill that role. He is King of kings and Lord of lords. Scripture confirms that Oprah is wrong, “Neither is there salvation in any other: for there is no other name under heaven given among men whereby we must be saved” (Acts 4:12).